Whether responding to a need in our local communities or to a global disaster, the Metro-East Interfaith Partnership strives to respond together in to affirm that regardless of our faith traditions, we are one in the human family. We gathered as members of various faith traditions to offer prayers for the homeless in our community. See news story and photos. Youth and adults gathered on a day off from school to tear down walls between faith traditions as they worked together tearing out walls to make way for a community food pantry in Belleville. Faith traditions included Bahá'í, Christian (Church of Christ, Community of Christ, Latter Day Saints, Disciples), Hindu, and Muslim. Faith Beyond Walls, the Metro-East Interfaith Partnership, and Neighbors for Renewal partnered together for an interfaith service project on Saturday, September 16, 2006. 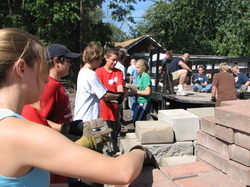 Youth and adults from Jesus Christ of Latter Day Saints, St. Mark Lutheran, St. George's Episcopal, Crossroads Christian, Agudas Achim/Beth Israel, and Holy Child Catholic worked together doing inside clean-up and moving bricks and blocks for the rehab of a house in downtown Belleville. Following the work youth and adults enjoyed a pizza party and conversation about our faith. Faith Beyond Walls and the Metro-East Interfaith Partnership joined together in hosting a youth and family service project on Sunday, May 7, 2006 at Edgemont Elementary School in East St. Louis. Christians and Jews worked side-by-side clearing a fence row, trimming overgrown trees, spreading mulch, painting, and picking up trash. The afternoon began with informal games and interfaith dialogue, helping the youth get better acquainted with one another's faith traditions. Leaders from various religions gathered in September 2005 in prayer for victims of Hurricane Katrina and world peace. The Metro-East Interfaith Partnership hosted the prayer service and dinner, welcoming different religions including Islam, Jewish, Christian, Bahai and Religious Science. When the earthquake shook Pakistan in 2005, the Metro-East Interfaith Partnership responded by collecting blankets to have shipped to Pakistan.